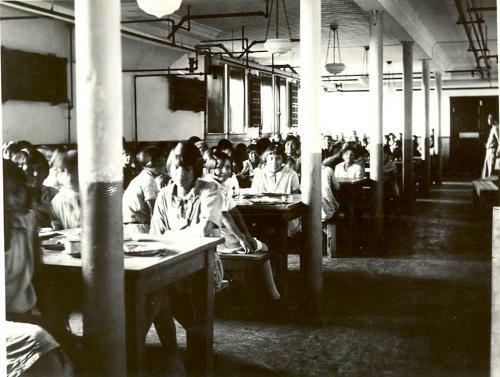 Children’s dining room, Indian Residential School, Edmonton, Alberta. Between 1925-1936. United Church Archives, Toronto, From Mission to Partnership Collection. Two primary objectives of the residential school system were to remove and isolate children from the influence of their homes, families, traditions and cultures, and to assimilate them into the dominant culture. These objectives were based on the assumption Aboriginal cultures and spiritual beliefs were inferior and unequal. Indeed, some sought, as it was infamously said, “to kill the Indian in the child.” Today, we recognize that this policy of assimilation was wrong, has caused great harm, and has no place in our country. What was the Indian residential school system? The term residential schools refers to an extensive school system set up by the Canadian government and administered by churches that had the nominal objective of educating Aboriginal children but also the more damaging and equally explicit objectives of indoctrinating them into Euro-Canadian and Christian ways of living and assimilating them into mainstream Canadian society. The residential school system operated from the 1880s into the closing decades of the 20th century. The system forcibly separated children from their families for extended periods of time and forbade them to acknowledge their Aboriginal heritage and culture or to speak their own languages. Children were severely punished if these, among other, strict rules were broken. Former students of residential schools have spoken of horrendous abuse at the hands of residential school staff: physical, sexual, emotional, and psychological. Residential schools provided Aboriginal students with an inferior education, often only up to grade five, that focused on training students for manual labour in agriculture, light industry such as woodworking, and domestic work such as laundry work and sewing. Residential schools systematically undermined Aboriginal culture across Canada and disrupted families for generations, severing the ties through which Aboriginal culture is taught and sustained, and contributing to a general loss of language and culture. Because they were removed from their families, many students grew up without experiencing a nurturing family life and without the knowledge and skills to raise their own families. The devastating effects of the residential schools are far-reaching and continue to have significant impact on Aboriginal communities. Because the government’s and the churches’ intent was to eradicate all aspects of Aboriginal culture in these young people and interrupt its transmission from one generation to the next, the residential school system is commonly considered a form of cultural genocide. From the 1990s onward, the government and the churches involved—Anglican, Presbyterian, United, and Roman Catholic—began to acknowledge their responsibility for an education scheme that was specifically designed to “kill the Indian in the child.” On June 11, 2008, the Canadian government issued a formal apology in Parliament for the damage done by the residential school system. In spite of this and other apologies, however, the effects remain. What led to the residential schools? European settlers in Canada brought with them the assumption that their own civilization was the pinnacle of human achievement. They interpreted the socio-cultural differences between themselves and the Aboriginal peoples as proof that Canada’s first inhabitants were ignorant, savage, and—like children—in need of guidance. They felt the need to “civilize” the Aboriginal peoples. Education—a federal responsibility—became the primary means to this end. 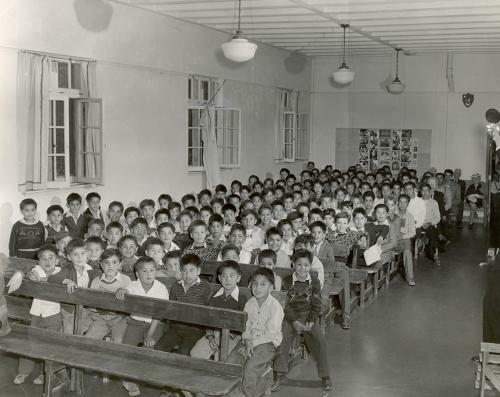 Male students in the assembly hall of the Alberni Indian Residential School, 1960s. United Church Archives, Toronto, from Mission to Partnership Collection. 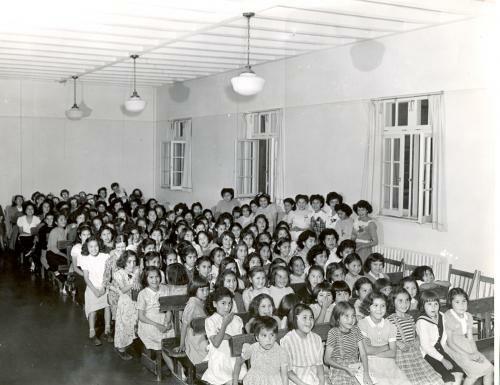 Female students in the assembly hall of the Alberni Indian Residential School, 1960s. United Church Archives, Toronto, from Mission to Partnership Collection. The purpose of the residential schools was to eliminate all aspects of Aboriginal culture. Students had their hair cut short, they were dressed in uniforms, and their days were strictly regimented by timetables. Boys and girls were kept separate, and even siblings rarely interacted, further weakening family ties.2 Chief Bobby Joseph of the Indian Residential School Survivors Society recalls that he had no idea how to interact with girls and never even got to know his own sister “beyond a mere wave in the dining room.”3 In addition, students were strictly forbidden to speak their languages—even though many children knew no other—or to practise Aboriginal customs or traditions. Violations of these rules were severely punished. Residential school students did not receive the same education as the general population in the public school system, and the schools were sorely underfunded. Teachings focused primarily on practical skills. Girls were primed for domestic service and taught to do laundry, sew, cook, and clean. Boys were taught carpentry, tinsmithing, and farming. Many students attended class part-time and worked for the school the rest of the time: girls did the housekeeping; boys, general maintenance and agriculture. This work, which was involuntary and unpaid, was presented as practical training for the students, but many of the residential schools could not run without it. With so little time spent in class, most students had only reached grade five by the time they were 18. At this point, students were sent away. Many were discouraged from pursuing further education. Some former students have fond memories of their time at residential schools, and certainly some of the priests and nuns who ran the schools treated the students as best they could given the circumstances. But even these “good” experiences occurred within a system aimed at destroying Aboriginal cultures and assimilating Aboriginal students. The process to phase out the residential school system and other assimilation tactics was slow and not without reversals. In the 1960s, the system’s closure gave way to the “Sixties Scoop,” during which thousands of Aboriginal children were “apprehended” by social services and removed from their families. The “Scoop” spanned roughly the two decades it took to phase out the residential schools, but child apprehensions from Aboriginal families continue to occur in disproportionate numbers. In part, this is the legacy of compromised families and communities left by the residential schools. It is clear that the schools have been, arguably, the most damaging of the many elements of Canada’s colonization of this land’s original peoples and, as their consequences still affect the lives of Aboriginal people today, they remain so. The residential school system is viewed by much of the Canadian public as part of a distant past, disassociated from today’s events. In many ways, this is a misconception. The last residential school did not close its doors until 1986. Many of the leaders, teachers, parents, and grandparents of today’s Aboriginal communities are residential school survivors. There is, in addition, an intergenerational effect: many descendents of residential school survivors share the same burdens as their ancestors even if they did not attend the schools themselves. These include transmitted personal trauma and compromised family systems, as well as the loss in Aboriginal communities of language, culture, and the teaching of tradition from one generation to another. According to the Manitoba Justice Institute, residential schools laid the foundation for the epidemic we see today of domestic abuse and violence against Aboriginal women and children.17 Generations of children have grown up without a nurturing family life. As adults, many of them lack adequate parenting skills and, having only experienced abuse, in turn abuse their children and family members. The high incidence of domestic violence among Aboriginal families results in many broken homes, perpetuating the cycle of abuse and dysfunction over generations. Many observers have argued that the sense of worthlessness that was instilled in students by the residential school system contributed to extremely low self-esteem. This has manifested itself in self-abuse, resulting in high rates of alcoholism, substance abuse, and suicide. Among First Nations people aged 10 to 44, suicide and self-inflicted injury is the number one cause of death, responsible for almost 40 percent of mortalities.18First Nations women attempt suicide eight times more often than other Canadian women, and First Nations men attempt suicide five times more often than other Canadian men.19 Some communities experience what have been called suicide epidemics. Many Aboriginal children have grown up feeling that they do not belong in “either world”: they are neither truly Aboriginal nor part of the dominant society. They struggle to fit in but face discrimination from both societies, which makes it difficult to obtain education and skills. The result is poverty for many Aboriginal people. In addition, the residential schools and other negative experiences with state-sponsored education have fostered mistrust of education in general, making it difficult for Aboriginal communities and individuals to break the cycle of poverty. The court cases continued, and in 1995, thirty survivors from the Alberni Indian Residential School filed charges against Arthur Plint, a dorm supervisor who had sexually abused children under his care. In addition to convicting Plint, the court held the federal government and the United Church responsible for the wrongs committed. Truth and Reconciliation Commissions are used around the world in situations where countries want to reconcile and resolve policies or practices, typically of the state, that have left legacies of harm. The Truth and Reconciliation Commission is a non-adversarial way to allow residential school survivors to share their stories and experiences and, according to the Department of Indian Affairs, will “facilitate reconciliation among former students, their families, their communities and all Canadians” for “a collective journey toward a more unified Canada. Meanwhile, the Royal Commission on Aboriginal Peoples had been interviewing Indigenous people across Canada about their experiences. The commission’s report, published in 1996, brought unprecedented attention to the residential school system—many non-Aboriginal Canadians did not know about this chapter in Canadian history. In 1998, based on the commission’s recommendations and in light of the court cases, the Canadian government publicly apologized to former students for the physical and sexual abuse they suffered in the residential schools. The Aboriginal Healing Fund was established as a $350 million government plan to aid communities affected by the residential schools. However, some Aboriginal people felt the government apology did not go far enough, since it addressed only the effects of physical and sexual abuse and not other damages caused by the residential school system. In 2005, the Assembly of First Nations launched a class action lawsuit against the Canadian government for the long-lasting harm inflicted by the residential school system. In 2006, the Indian Residential Schools Settlement Agreement was reached by the parties in conflict and became the largest class action settlement in Canadian history.22 In September 2007, the federal government and the churches involved agreed to pay individual and collective compensation to residential school survivors. The government also pledged to create measures and support for healing and to establish a Truth and Reconciliation Commission. I have just one last thing to say. To all of the leaders of the Liberals, the Bloc and NDP, thank you, as well, for your words because now it is about our responsibilities today, the decisions that we make today and how they will affect seven generations from now. My ancestors did the same seven generations ago and they tried hard to fight against you because they knew what was happening. They knew what was coming, but we have had so much impact from colonization and that is what we are dealing with today. Women have taken the brunt of it all. Thank you for the opportunity to be here at this moment in time to talk about those realities that we are dealing with today. What is it that this government is going to do in the future to help our people? Because we are dealing with major human rights violations that have occurred to many generations: my language, my culture and my spirituality. I know that I want to transfer those to my children and my grandchildren, and their children, and so on. What is going to be provided? That is my question. I know that is the question from all of us. That is what we would like to continue to work on, in partnership. Read the full transcript and watch the video here. We feel that the acceptability of the apology is very much a personal decision of residential school survivors. The Nisga’a Nation will consider the sincerity of the Prime Minister’s apology on the basis of the policies and actions of the government in the days and years to come. Only history will determine the degree of its sincerity. In September 2007, while the Settlement Agreement was being put into action, the Liberal government made a motion to issue a formal apology. The motion passed unanimously. On June 11, 2008, the House of Commons gathered in a solemn ceremony to publicly apologize for the government’s involvement in the residential school system and to acknowledge the widespread impact this system has had among Aboriginal peoples. You can read the official statement and responses to it by Aboriginal organizations here. The apology was broadcast live across Canada (watch it here). The federal government’s apology was met with a range of responses. Some people felt that it marked a new era of positive federal government–Aboriginal relations based on mutual respect, while others felt that the apology was merely symbolic and doubted that it would change the government’s relationship with Aboriginal peoples. Although the apologies and acknowledgements made by governments and churches are important steps forward in the healing process, Aboriginal leaders have said that such gestures are not enough without supportive action. Communities and residential school survivor societies are undertaking healing initiatives, both traditional and non-traditional, and providing opportunities for survivors to talk about their experiences and move forward to heal and to create a positive future for themselves, their families, and their communities. We are on the threshold of a new beginning where we are in control of our own destinies. We must be careful and listen to the voices that have been silenced by fear and isolation. We must be careful not to repeat the patterns or create the oppressive system of the residential schools. We must build an understanding of what happened to those generations that came before us. Canada. Royal Commission on Aboriginal Peoples. Report of the Royal Commission on Aboriginal Peoples, Volume 1: Looking Forward, Looking Back. Chapter 10, “Residential Schools.” Ottawa: Supply and Services Canada, 1996. Fournier, Suzanne and Ernie Crey. Stolen from our Embrace: The Abduction of First Nations Children and the Restoration of Aboriginal Communities. Vancouver: Douglas & McIntyre, 1997. Haig-Brown, Celia. Resistance and Renewal: Surviving the Indian Residential School. Vancouver: Arsenal Pulp Press, 1998. First published by Tillicum Library, 1988. Manitoba. Public Inquiry into the Administration and Aboriginal People. “Aboriginal Women.” Vol. 1, chap. 13, in Report of the Aboriginal Justice Inquiry of Manitoba.Winnipeg: Public Inquiry into the Administration and Aboriginal People, 1999. This chapter of the Aboriginal Justice Inquiry of Manitoba’s report on Aboriginal people in the justice system examines how the residential school system has contributed to the abuse and discrimination that many Aboriginal women face regularly. Miller, J. R. Shingwauk’s Vision. Toronto: University of Toronto Press, 1996. Milloy, John S. A National Crime: The Canadian Government and the Residential School System, 1879 to 1986. Winnipeg: University of Manitoba Press, 1999. Nuu-chah-nulth Tribal Council, Indian Residential Schools: The Nuu-Chah-Nulth Experience. Nuu-chah-nulth Tribal Council, 1996. Roberts, John. First Nations, Inuit, and Métis Peoples: Exploring their Past, Present, and Future. Toronto: Emond Montgomery, 2006. Secwepemc Cultural Education Society, Behind Closed Doors: Stories from the Kamloops Indian Residential School. Penticton: Secwepemc Cultural Education Society & Theytus, 2000. Canadian Broadcast Commission. Truth and Reconciliation: Stolen Children. This site contains FAQ on residential schools and compensation here. United Church of Canada. “Aboriginal Peoples: Indian Residential Schools.” This site contains the United Church’s 1998 apology here. Presbyterian Church in Canada. Remembering the Children: An Aboriginal and Church Leaders’ Tour to Prepare for Truth and Reconciliation. This site contains the Presbyterian church’s 1994 confession here. Royal Canadian Mounted Police. Indian Residential Schools. This site contains the RCMP apology here. Paper prepared for the conference The Tragic Legacy of Residential Schools: Is Reconciliation Possible? hosted by the Assembly of First Nations and the University of Calgary, March 12–13, 2004. Indian and Northern Affairs Canada. “Indian Residential Schools.” This site contains Canada’s “Statement of Apology” and video clips of Prime Minister Harper delivering the apology in the House of Commons here. 1 Roberts, John. First Nations, Inuit, and Métis Peoples: Exploring their Past, Present, and Future. Toronto: Emond Montgomery, 2006. 119. 3 Joseph, Bobby. Guest lecture. Introduction to First Nations Studies. University of British Columbia, Vancouver, BC. 12 March 2009. 4 Haig-Brown, Celia. Resistance and Renewal. Vancouver: Arsenal Pulp Press, 1998. 16. 5 Milloy, John S. A National Crime: The Canadian Government and the Residential Scohol System, 1879 to 1986. University of Manitoba Press, 1999. 91–2; Fournier and Crey, Stolen from Our Embrace. Vancouver: Douglas & McIntyre, 1997. 49. 6 Milloy, 91; Fournier and Crey, 49. 7 Fournier, Susan and Ernie Crey, 72. 9 Fournier and Crey, 49; Milloy, 101–2. 10 Canada. Royal Commission on Aboriginal Peoples, Volume 1: Looking Forward, Looking Back. Chapter 10, “1.2 Changing Policies.” Ottawa: Supply and Services Canada, 1996. 344-353. 15 Dixon, Alvin. Guest lecture. Introduction to First Nations Studies. University of British Columbia, Vancouver, BC. 12 March 2009. 18 Frideres & Gadacz, Aboriginal Peoples in Canada. Toronto: Pearson Prentice Hall, 2008. 81. 19 Frideres & Gadacz, 85. 21Communiqué of the Holy See Press Office, April 24, 2009. Living in Canada, there is a long past with the Indigenous people. The relationship between the white and First Nations community is one that is damaged because of our shameful actions in the 1800’s. Unnecessary measures were taken when the Canadian government planned to assimilate the Aboriginal people. Through the Indian Act and Residential schools the government attempted to take away their culture and “kill the Indian in the child.” The Indian Act allowed the government to take control over the people, the residential schools took away their culture and tore apart their families, and now we are left with not only a broken relationship between the First Nations people but they are trying to put back together their lives while still living with a harsh reality of their past. Our Indian legislation generally rests on the principle, that the aborigines are to be kept in a condition of tutelage and treated as wards or children of the State. …the true interests of the aborigines and of the State alike require that every effort should be made to aid the Red man in lifting himself out of his condition of tutelage and dependence, and that is clearly our wisdom and our duty, through education and every other means, to prepare him for a higher civilization by encouraging him to assume the privileges and responsibilities of full citizenship. Through the Indian Act the government was now able to assimilate and “kill the Indian in the child.” Residential schools began in the 1870’s but when the Indian Act was passed in 1876 it became mandatory for all First Nations children to attend these schools.